Deerpaw is an Independent Folk/Progressive Bluegrass inspired band from Tulsa, Oklahoma. They produce a distinctive sound derived from their use of traditional technique and melody accompanied by modern composition. 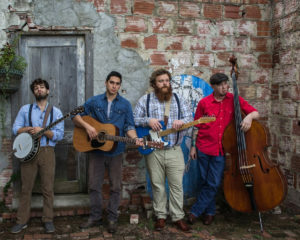 Guitar tones reminiscent of western swing, along with the familiar sounds of Appalachian Mountain music, gives the band a creative twist on a nostalgic sound. Deerpaw’s songs are wide ranging from leisurely dance numbers, to traditional mountain murder ballads, and thought provoking songs of dreams and perseverance amidst heartbreak. The band came together in the Fall of 2015 and have since written original music that is attracting audiences of all ages and musical tastes.